A large part of your baby’s brain develops AFTER it is born, much of that brain development is from the child’s interactive experiences- the brain acclimates, changes and adopts to the new environment. The brain makes new connections from stimuli in the environment, maybe a trillion initial connections in the first five years. These first connections builds emotional development and learning. Everything you do builds the baby’s brain power- scary thought! Showing affection through non-verbal actions. Babies know words and their mothers voices, they are happier hearing her voice instead of a stranger. They love sing song verbal clues- “motherese” talk. Babies continue to build brain power through preschool and kindergarten, keep filling their mind with plenty of creative foods. Connect with your young child; Make a movement of your hand/arm outward in front of him- help him connect, empowering his brain to do the same, have him follow the action. Next do the other side, same motion- repeat. This sets up mirroring and can enhance the brain development. Neurons in the brain fire to duplicate the motion automatically- it is challenging. Early infancy you may see tongue sticking out, smiling, or cooing as the brain builds awareness. Older children love this game too, clapping or stomping feet in a pattern- fast then slow keeps their attention. What’s alike mean? Using a deck of cards have your child find two that look the same- number, color or shape. Then have them pile up the similar ones in two matching ways. His brain likes new activities this leads to new cell connections- higher level of thinking. Counting and sorting jewels, some even fit in my purse! Fantasy Play helps develop the brain by building creative awareness, color awareness, tactile knowledge, emotional interactions, pretending and letting the imagination go, builds brain power. Fill a surprise bag full of beautiful scrapes of fabrics, trims,fur, feathers, belts, hats- old unused stuff. Change the contents periodically, making the child aware by tying a ribbon around the top or placing a new sticker. The child will pick out what he or she really wants to feel or look at. Boys love this game also. Create a giving jug, that just makes good cents! Teach something nice or thoughtful for the child to build empathy. Donate the jug(or jar, piggy bank, etc. ) to a person so the child can understand and relate a NEED. Research shows that the brain naturally has the ability to care about others, this ability needs to be developed and reinforced so the child understands what NEED means. Cognitive (brain) development is just ONE domain of teaching the whole child,cross categorical teaching should occur to enhance several domains at once, watch for more ideas to come each month. Simple types of behavior builds cognitive development, watch to see how the child comes up with different ideas and solutions. 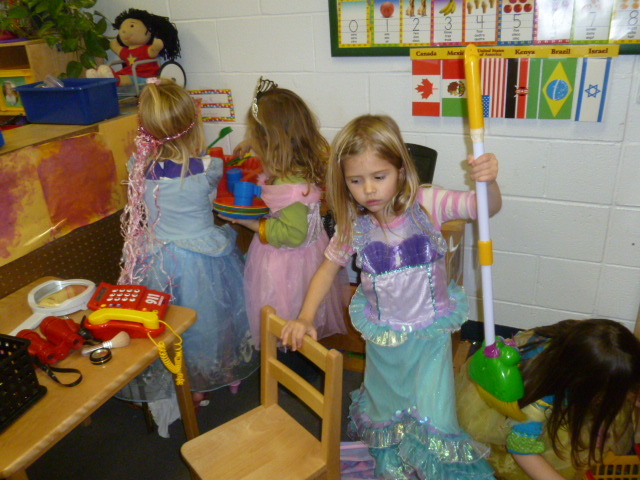 How about dressing up while hammering and building blocks- lots of ideas are working here. The brain is checking all kinds of concepts out here! Role play, imagination at it’s best.